We have done lots of fun things since we have been on the Shore. One of our favorite things was going to the fruit farm to pick fruit! We picked some apples, lots of blueberries and some peaches for Daddy. Tucker found an apple right away and ate it while we searched for others. I think our favorite thing to pick was blueberries. Caroline was great about picking only the blues ones and not the green or purple berries. 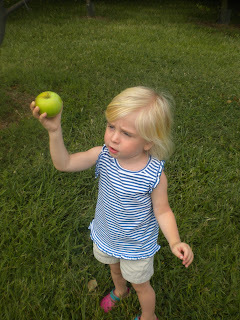 She got very frustrated when Tucker would try to drop a green berry in the bag! Tucker spent most of the time at one blueberry bush pulling off berries one by one and eating them. He did not contribute much to our berry collection. We loved eating the fresh peaches and the kids enjoyed the apples. Caroline and I made blueberry dumplings this week and they were yummy. Well, at least the adults thought so...Caroline said they were "too blueberry." Chad and I hope to get back next week to get more blueberries and some blackberries.